There are many forms of Honey Fungus, and in some books they are all given the scientific name Armillaria mellea even though it is now accepted that there are several distinct species. This parasitic fungus can do immense damage to forests and is greatly feared by foresters and gardeners alike; it attacks both coniferous and occasionally broad-leaf trees. By the time the fruit bodies are in evidence, the damage internally is usually so great that the tree is doomed. Honey Fungi are long lived, not as mushrooms but as fine interwoven hyphal threads called mycelia, living and within the soil and feeding on living or dead wood. In suitable habitats an underground mycelium can grow continually for many hundreds and perhaps even thousands of years. 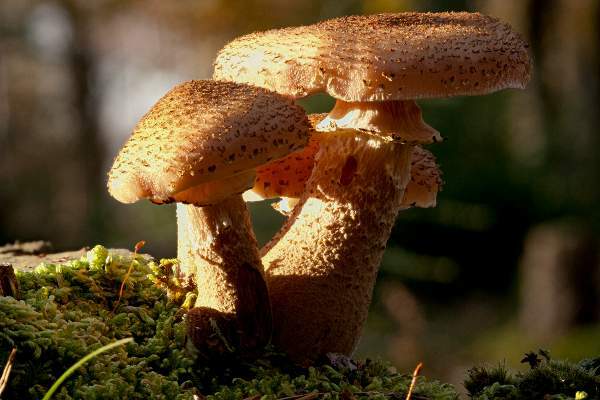 For example in 1992 an expanding filled-in fairy ring of Armillaria ostoyae was in Washington state was found covering an area of some 1,500 acres; it was declared at the time to be the world's largest known living organism. Very common in most areas, particularly where the soil is acidic, this fungus occurs throughout Britain and Ireland as well as mainland Europe, parts of Asia and in North America. 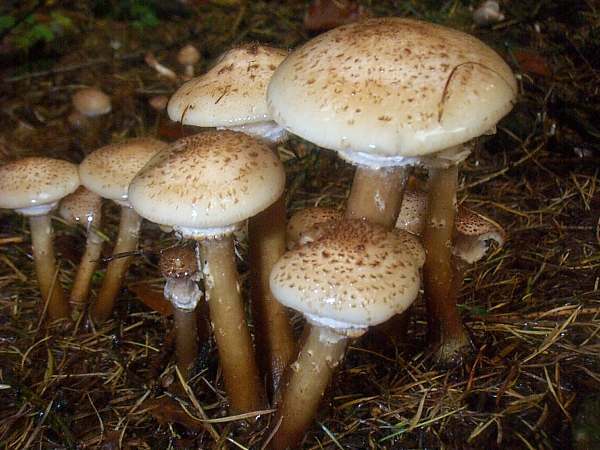 Armillaria species are also present in Australia and New Zealand. 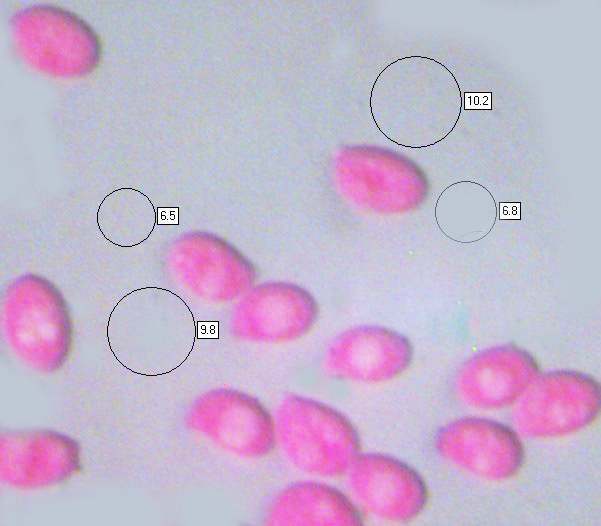 This species was described in 1970 by Henri Charles Louis Romagnesi (1912 - 1999), who named it Armillariella ostoyae. Dark Honey Fungus was moved into its present genus and renamed Armillaria ostoyae in 1973 by Czech mycologist Josef Herink (1915 - 1999). 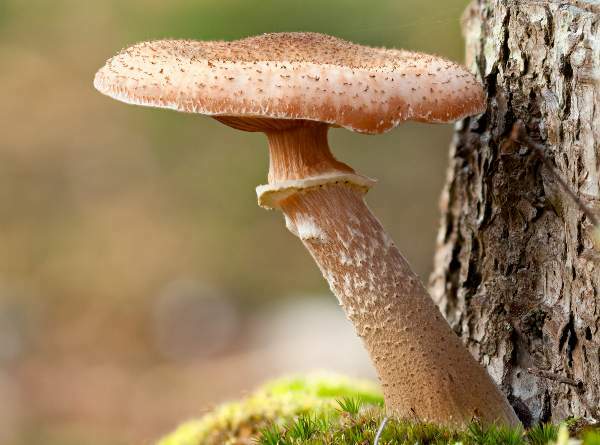 Some authorities, particularly in the USA, now favour the name Armillaria solidipes Peck, based on a honey-coloured mushroom which they believe was the Dark Honey Fungus and had been described in a 1900 publication by American mycologist Charles Horton Peck (1833- 1917). 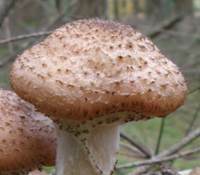 Synonyms of Armillaria ostoyae include Armillaria obscura (Schaeff.) Horak and Armillaria polymyces (Gray) Singer & Clémençon. Honey Fungus or, as it is sometimes called, Honey Mushroom is quite obviously a reference to the colour of caps of Armillaria ostoyae. The origin of the specific epithet ostoyae may be a reference to Ostoja, also known as Dzerzhanovka, in the Ukraine. Perhaps this is the location from where the type specimen was collected. 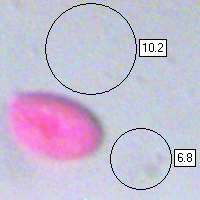 5 to 15cm in diameter, deeply convex then flattening with a depressed centre; colour typically red-brown but hygrophanous and drying out much paler; covered in brown scales when young, but these are less evident at maturity, when the margin becomes virtually scaleless and noticeably striate. The cap flesh is white and firm. The weakly decurrent gills are crowded and white, gradually becoming cream or pinkish buff. White above the ring; coloured as cap below; cylindrical; 5 to 15mm in diameter and 6 to 15cm tall with a finely woolly surface. The stem flesh is white, full and fairly firm. A whitish double ring with distinctive dark brown or black scales on its underside persists to maturity; this feature helps differentiate Armillaria ostoyae from Armillaria mellea. Ellipsoidal, smooth, 8-11 x 5-7µm. Parasitic on conifer trees and occasionally broadleaf trees; also occurring as a saprobic fungus on dead stumps and roots, and occasionally on fallen branches. 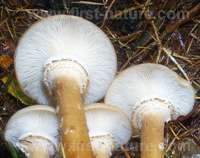 Armillaria mellea, Honey Fungus, has a very scaly cap and a yellowish stem ring without dark scales on its underside. Armillaria tabescens, sometimes referred to as the Ringless Honey Fungus, has no stem ring and its gills turn pinkish-brown at maturity. Pholiota squarrosa is generally similar in colour and covered in scales; it retains an in-rolled margin, its gills turn uniformly rusty-brown, and it has a radish-like smell and taste. Although all Armillaria species were for many years generally considered edible when thoroughly cooked, members of the honey fungus group (including Armillaria mellea, the type species of this genus) that occur on hardwoods are considered by some to be suspect, as cases of poisoning have been linked to eating these fungi; this is most probably due to a small but significant proportion of people being adversely affected rather than a universal human reaction to these fungi. 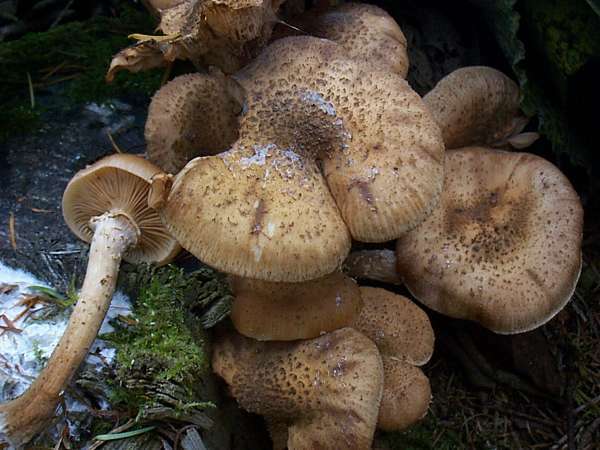 Armillaria ostoyae, which occurs on conifers and particularly often on spruces, is generally considered edible when properly cooked. (The stems are tough and are best discarded.) As with all fungi, it is advisable to eat only a small portion initially until you are sure that you do not have any adverse reactions to this particular species.